Nick’s Sunflower is based solely around the Sunflower, or what a sunflower would smell like if it had a scent…The scent is delicate, fun and happy, yet an intriguing choice for a fragrance as the sunflower actually has no scent. So reads the press release accompanying EB Florals Nick’s Sunflower. As the press release further informs us, EB Florals's founder Eric Buterbaugh is a “globally renowned floral designer” who “embarked on an exciting venture to return perfumery to its refined luxury status” by paying “homage to the sublime notes of highly coveted flowers.” Nick’s Sunflower was inspired by Venice, California, hat designer Nick Fouquet, who loves sunflowers, a flower Eric Buterbaugh admits he’s not wild about. Now, back to this abstract interpretation of a sunflower. What might a sunflower smell like to you? I think of heat, earth, corn cobs and squirrel fur. (Good thing I don’t have my own perfume line, huh?) From sampling Nick’s Sunflower, I conclude the folks at EB Florals think of peppery musk. Nick’s Sunflower was developed by nose Ilias Ermenidis and includes notes of linden, quince, litchi, narcissus absolute, nectarine, orange flower, tiare, jasmine sambac, osmanthus, tuberose absolute, musk and ambrox. Despite this marvelous list of juicy fruit and vibrant flowers with its kick of hay and leather, its overall feel is of burr-like peppery musk. Imagine King Kong with a name tag that reads “Peppery Musk” clutching a few wilted tuberose petals in one hand and a sliver of bruised orange peel in the other, and you have Nick’s Sunflower. This couldn’t be right. Look at the mouthwatering list of notes. Plus, a talented nose with lots of training and a support team of professionals created this fragrance. At least a few other people likely weighed in on it, too. Surely, they wouldn’t greenlight a perfume that smelled like the worst part of the past five years of department stores fragrances? I wondered if my skin was distorting Nick’s Sunflower, so I pumped four or five spritzes on a cotton napkin. The musk was much less prominent on cloth, and it smelled more citrusy — at first. Then the peppery musk wafted to the forefront, but it wasn’t as pronounced as on my skin. I liked Nick’s Sunflower better on fabric. I also thought, maybe it’s my nose. Maybe I don’t have the nasal sensors (I’m sure this is how a biologist would describe it) to complete the fragrance. After half an hour on skin, Nick’s Sunflower’s peppery musk does quiet — in fact, the whole fragrance retreats to a subdued hum that would be fine in an office, no problem. But the weave of peppery musk that survives feels like the sting of an earlier slap, and I have a hard time smelling past it. Nick’s Sunflower lasts a good four or five hours, and it reads to me as perfectly unisex. If any of you have tried Nick’s Sunflower, please comment on your experience, especially if it was positive. Let me know what I’m missing! EB Florals Nick’s Sunflower Eau de Parfum is available at Saks Fifth Avenue and at the Eric Buterbaugh Gallery. 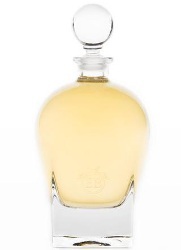 It is available in a 250 ml crystal decanter ($495), 100 ml crystal decanter ($295), and a 10 ml sampling vial ($75). 1. Except for the ellipsis in brackets, the ellipses don’t indicate any missing text and are part of the original press release. 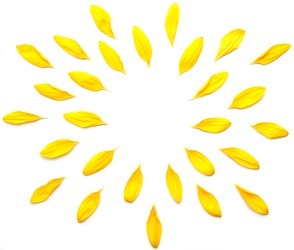 Note: top image is Sunflower petals [brightened] by ProFlowers at flickr; some rights reserved. Can’t bear those peppery musks – they ruin so many modern fragrances. I’ll take your squirrel fur over that any day of the week! I’m perplexed as to why peppery musk is so popular. It’s not pretty, and it’s not even ugly in a good way. I’m stumped. I’ll stick with the classic Elizabeth Arden Sunflowers! Waaah! I was just thinking someone needed to develop a linden and jasmine combo after smelling it “in the wild” in Aix-en-Provence. AND I’m from the Sunflower State (Kansas). Maybe Tauer or SSS can do it. What a heady experience that must have been to smell that–and in Provence, no less! I can see why you’d want to recreate it. Have you tried Ann Gerard’s Ciel d’Opale? They don’t actually list linden as a note but it smells more like real linden than any of the linden scents I’ve smelled (might be what is listed as honeysuckle). There are rows of linden trees blooming right now where I live. Cd’O also has jasmine. Just sayin’…. Ooh, I haven’t, but I really like her Rose Cut! Your description sounds like it might be what I’m looking for. I’ve got a bunch of linden samples wending their way to me now, but I’m always happy to try more. I love Rose Cut, too! I cherish my bottle. I really like Ciel d’Opale and LOVE Perles de Mousse. Hmm, I think I hear the faint pitter-pat of lemming feet outside my door…. I could look at it this way: if you are going to make a perfume that smells of a flower that doesn’t particularly smell of anything, then some peppery musk could be a solution? It could, as long as you like peppery musk. For me–maybe not for everyone!–peppery musk is a greased pole to a headache. Still laughing over this review, Angela! And I find it extremely ironic that their press release states: “…paying homage to the sublime notes of highly coveted flowers” and then he picks a flower with no scent! Wha???? And at those prices. Aspirational indeed! I know–it was kind of mean of me to include that snippet of press release. I had to clean up the list of notes, too, because it (for instance) included “Natureprint” as a note when it’s the name for a proprietary sort of headspace technology. But your adding that made for such great reading! And they did seem proud of it….. I should add that I’m really happy to see that they offer a 10 ml size! I wish more perfume houses did that. Mixed blessing! Do you want even 10 ml. of this? Or are you being optimistic for future releases? I don’t, in fact, want 10 ml of this one. But I like the idea in principle of the 10 ml size! I bought a sample because I fell in love with the list of notes (after talking myself of blindly buying the small spray) and I’m so glad I only got the sample. The peppery aspect didn’t bother me, but I was underwhelmed. I guess I was hoping for magic because I love fields of sunflowers so much. I’ve only seen whole fields of sunflowers once, and it bowled me over. It truly was beautiful. Interesting. I’ve never done this, but would be fun to line up two or three willing friends, spray them with the same perfume and get them to smell it on their own AND each other’s skins. Would that peppery musk be so prominent to you on someone else? Would they notice it on themselves? On you? It all comes down to the relationship between how a perfume reacts on our skins and how it is processed through our brains. So interesting. I’ve never done this sort of experiment, either, but now I’m tempted. It would be fun to choose, say, three fragrances to play around with. You can do this at our house with friends, for example, or simply go shopping with a group and all try the same fragrances. It’s very revealing. Anyone who denies that skin doesn’t make a difference must never have been in a group of people all wearing the same thing. I know just what you mean. I think a person’s personality influences how well a scent “jives” with them, too. This is a really good idea for an experiment. As a matter of fact, Dawn Spencer Hurwitz actually sells a fragrance called Special Formula X, which is a musk fragrance that she uses to identify the skin type of her clients (imagine that–she admits skin type makes a difference). On almost everyone the musk evolves in different ways over time, becoming sweeter, more woody, more floral, etc. That helps her figure out what fragrance notes you might want to avoid. I did some testing with a perfumista friend who has an excellent nose and the results were intriguing and seemed to confirm the conclusions we’d already come to through experience. This is the first I’ve heard of Formula X, and I’m fascinated! What a great idea. That is so interesting! I’d love to try it on both men and women. I have often wondered whether masculine and feminine skins bring out different notes in the same perfume. It would be fun to try on different colorings, too, to see if the old saws about certain fragrances favoring brunettes, etc., are true. On the other hand, there are things I get just from sniffing the bottle that are just awful, like that spiky wood and probably some musks as well. Someone even recently used me as a “tester” asking me to sniff something on a strip to verify that it had the synthetic wood in it. Took me a split second: yes it did! From what your friend B. says about you, you and I are scent twins! Do you amp and/or hate musk? I don’t think I amp musks (though possibly that’s going on with the Tauers for me?) but now that you mention it, I probably don’t like it much. That being said, I wonder about the musk in vintage fragrances (since those almost always smell good to me even if I don’t like them, if you know what I mean). I’d have to know more about your skin & tastes to claim you as an official twin, but for now we can be scent sisters! Exactly! The musk in vintage scents is the outlawed nitro musk. I don’t dislike or even notice the smell of that, although from what I’ve read, it does have some iffy/bad health implications. And my perfume taste in a nutshell: I could give away all of my perfume except my old Guerlains and still be perfectly fine. I wore some vintage Shalimar extrait last night while I read and LOVED it. I can relate, and I have to wonder if that’s the issue with me and particular peppery woody musks that have been showing up everywhere. I can’t stand them, but they’re getting harder to avoid, especially in modern department store fragrances. Someone, maybe Laura?, sent me several samples of Buterbaugh’s scents… I was totally underwhelmed. I love his bottles, and the backstory of the floral designer turned perfume brand, etc. But the copy you posted says it all, “Nick’s Sunflower was inspired by Venice, California, hat designer Nick Fouquet, who loves sunflowers, a flower Eric Buterbaugh admits he’s not wild about.” Huh? I haven’t tried any of his other fragrances, and I guess I was hoping this one was an outlier. But it sounds like maybe it isn’t…. I like his Sultry Rose but I don’t like the price! His Apollo Hyacinth was nice but not nearly as true a hyacinth as Jo Malone’s Blue Hyacinth. Wow, do I love those EB bottles, though! Simply gorgeous. The crystal decanters really are nice–so classic. They’d be great on a dressing table. Gee, Angela, “heat, earth, and corn cobs” sounds pretty good to me. I’ve never smelled squirrel fur, though, so will reserve opinion there . . .
Me, neither! Let’s just say that “squirrel fur” is one of those conceptual notes.